Another 100 Powerful and Challenging Devotions to Strengthen, Encourage and Inspire You in Your Divine Calling as a Wife and Mother. You’ll want it beside your bed to read before you get up to face the day and to inspire you as you go to sleep at night. So encouraging as a wife and mother! Each morning I look forward to reading from this devotional. Nancy Campbell brings to life timeless truths from God's word as it relates to marriage, motherhood, and being a homemaker. She offers the constant reminder that motherhood is an eternally significant calling. I highly recommend this book! Nancy Campbell's words in her book are inspiring, they are like water to the soul, refreshing and I wish I could have found them when I was younger. Mothers will be armed with weapons to raise mighty women and men of God. Everyday, I am encouraged, challenged, educated and sometimes rebuked and lovingly put back on track. These devotionals (Books 1 & 2) are such a treasure. I wish I had the funds to buy case after case, to hand them out to every wife and mother I encounter! Thank you, Jesus for the magazine! I loved the first volume of Nancy's devotions, and having been through them 3 or 4 times, I just kept getting more and more each time I read through. I have just begun volume 2 and I have already been so blessed. Nancy just has an amazing talent at encapsulating so much encouragement in a short daily devotion, as well as packing in those scriptures. I always come away uplifted, encouraged and challenged to try and change just one little thing in my life today, to be more the woman God made me to be. I cannot recommend this book highly enough, it is fantastic. Well done Nancy for another brilliant book! The search for a worthwhile devotional that speaks to, and helps mothers rejoice, this is it. Wow, does this ever meet me where I am at. As a mom at home and a home-educator, I get a LOT out of this beautiful book. So great. 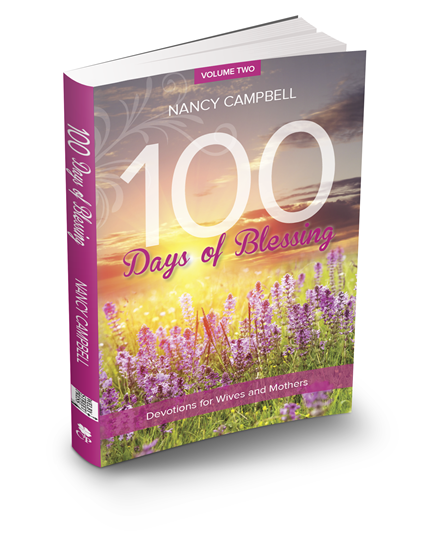 Click the button below to add the 100 DAYS OF BLESSING - VOLUME 2 to your wish list.